Perhaps no contractual clause invites as little respect as the noncompete agreement. In a few states, the agreement is void and unenforceable. In the remaining states, a noncompete agreement scarcely seems to rise to the level of a legally enforceable agreement. Too often, neither the parties to a noncompete agreement nor the court system believe in enforcement of the agreement as actually written. In most jurisdictions, courts routinely “blue pencil” or reform covenants that are not reasonable. 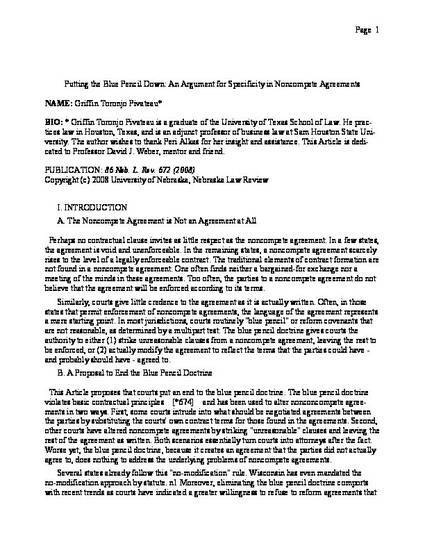 The blue pencil doctrine gives courts the authority to either strike unreasonable clauses from a noncompete agreement, leaving the rest to be enforced, or actually modify the agreement to reflect the terms that the parties could have—and probably should have—agreed to. This article proposes that courts put the blue pencil down and refuse to enforce noncompete agreements imposing unreasonable restraints. Moreover, when faced with an unreasonable noncompete agreement, courts should refuse to enforce even those clauses or covenants that standing alone would constitute reasonable restraints. Several states already follow this ‘no-modification’ rule. Moreover, this proposal comports with recent trends—courts have indicated a greater willingness to refuse to reform agreements that are not reasonable on their face. As an alternative to use of the blue pencil doctrine, this article proposes a threshold test that courts should conduct before applying their standard reasonableness analysis. The proposed threshold test involves a requirement for specificity. The proposed specificity test would determine whether a court should further evaluate the contract for enforceability.